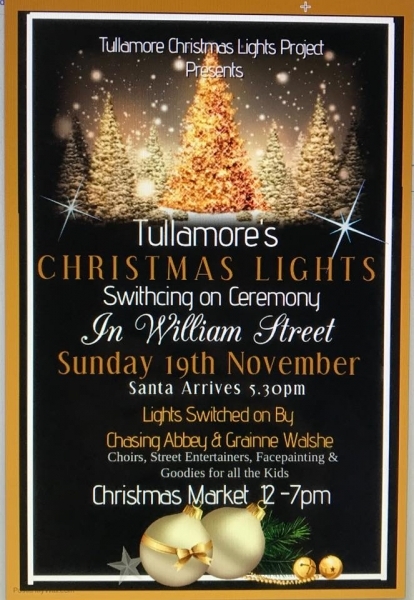 Home » News » Tullamore is the place to be – for the big Christmas lights switch-on, on Sunday November 19th! Santa parades from the train station to William street , lead by marching bands at 5.30pm, then the lights will be switched on by Champion women's boxer, Grainne Walshe and the lads from Chasing Abbey with choirs singing well into the evening. Christmas markets! Street entertainers!... and much more! Don’t miss the turning on of the Christmas lights in Tullamore - Sunday November 19th! Brought to you by the Tullamore Christmas Lights project.